Comics, comics everywhere! This was a gangbusters week as far as receiving new titles. So many in fact, I don’t have the energy or the time to list and link them all. I just couldn’t get my work done if I did. So I’m going with a picture and genres: sports, action/adventure, fairy tale, nonfiction and Spanish-language comics. Most of what I picked up this week is aimed at the elementary and middle school crowd, but I have been reading some great older teen and college level books that I can’t wait to publish. The reviews are already written. Next month is Black History Month and we will celebrate with some reviews of comics focusing on persons of color. Don’t feel obligated to only talk about minority populations during their respective months of focus. Disperse the dialogue and reading throughout the year. Enjoy the reviews this week, brought to you early by Old Man Winter and his cold blanket of snow. With the introduction of Apple’s new iPad, Wednesday was a big day for gadget heads, on-the-go email and Internet users, social networkers, bloggers, book readers … and comic lovers. Digital comics have been around for a little while. I even have some on my tiny little iPod as does our own Kevin Hodgson. It is cumbersome to read a comic on a handheld device, although people do it all the time. It’s not the best experience for me. The iPad, however, offers a platform for a robust comics reading experience, one in which a reader can transport hundreds or even thousands of full color comics in a device that is half an inch wide, weighs 1.5 pounds, and has a 10-hour battery life on a single charge. Comic publishers and creators seem enthusiastic with the introduction, but there is caution. Undoubtedly, the device could significantly affect local comic book stores, especially with individual monthly comic subscriptions. P.J. Bickett, president of Archaia Entertainment (publishers of MOUSE GUARD among many others) speculated that retail stores would have to switch from monthly comics to more trade paperback sales. After all, there surely will continue to be a market for printed comics from collectors and paper lovers. There is a special place for the holding and smelling of print, the rubbing of pages between fingers, the sound of the page flip, the presence of literature on the family bookshelf. I am optimistic about the iPad as I see it a great way to get comics in the hands of more readers. Bickett said it first, and I agree that Apple’s innovation can pave the way for publishers to invest in more off-Broadway comics and also give a longer shelf life to high quality, independent or alternative comics that might not have found a market in print. 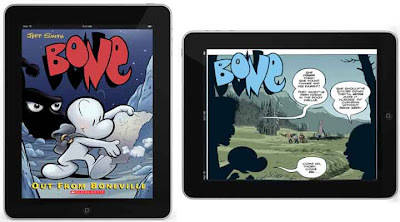 There is great potential for a school-based comics reading club (or traditional book club for that matter) to invest in 30 iPads pre-loaded with hundreds of titles. Students could even have an iPad assigned to them that already caters to books geared to that specific student’s preferences or literacy needs. I am making one prediction now. I suspect upcoming versions of the iPad will have an intelligent note-taking, hand writing translator. One in which a student could hand write notes in the margin of a book or comic then turn those handwritten words into a typeface and save it, with the option of printing the notes later. The push of a button or swipe of a finger would toggle between a note page/book page and the full screen book. Even handier would be a wireless download for the teacher so he or she could then view the student’s notes or graphic organizers to assess for understanding as the students read. A teacher could also assess to see if a student actually read the material. Going back to my support of dual texts (traditional book with comic adaptation) this would eliminate the fear among teachers that students might only read the comic and not touch the original novel. With a notes page, the teacher could assess by reading the students own notes and seeing if the student can compare and contrast the two formats. There’s not an app for that yet, but there could be. Note to app creators, I would love to be a consultant on such a hulking undertaking. I have other ideas as well. “M” is a 30-something balding man with a wife, a daughter and an active imagination. He shares his childhood and fatherhood experiences with us all, allowing us to live his touching – but mostly goofy – life with him. We explore Emory’s imaginative childhood as he digs up his family’s backyard looking for dinosaur bones, his playtime pretending to be a caveman, his dreams to be Gene Simmons from KISS, and his attempts to evade bullies. Intertwined in these events, Emory (known in adulthood as “M”) brings the stories full circle as he watches his daughter grow, live and experience life. Every moment is quirky and yet it is somehow a story that is well known. His old age and uncoolness are geek-chic, hysterical and make perfect sense to me. It all depends on your perspective. I read this book and thought of my relationship with my daughter and the fun times we have as she sprints halfway to the door before announcing we are in a race. Like M, I remember the times when I used to toss my girl in the air and I also finally came to a place where she was too big and I was too old to continue that activity. I exclaimed, “That’s me!” when M stood by the window in his underpants while the daughter could see him through the front glass. There’s nothing better than embarrassing your kid with your total lack of coolness. I frequently sing, dance and generally act nuts when my daughter has friends over. M gets it. I know he does. He gets me, and my relationship with my sweet cub. It’s those kinds of connections to a book that make the art of reading worthwhile. The payoff with PLANET SATURDAY COMICS is well worth twice the price of the book. Monty S. Kane’s illustrations are clear black and white images that bleed through with figurative color in form of memories and connections. His art drives the story and most importantly, the feelings of the reader. His images convey so much emotion in the most simplistic and comfortable way. It gives the feeling that we know M, that he is our best friend who is telling us stories around the kitchen table. PLANET SATURDAY COMICS is perfectly appropriate for anyone. However, I think the content is more grown-up fare, as kids’ experiences are more limited, although I think they would relate to the sections when M sings and his daughter is disgusted by his geekdom. This book takes life experience to really understand. At least it seems that way to me. I suspect that is because it is from the father’s perspective. There is no reason whatsoever that a child could not read it. They just may not get it, as children really aren’t the key audience. There is absolutely nothing herein to be concerned about. 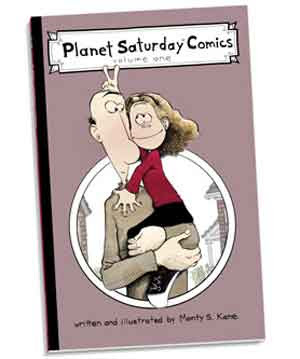 While I would not really use PLANET SATURDAY COMICS, in its entirety, with elementary children, I do think that certain sections could be used to talk about audience, perspective and voice. Kane’s style (in the sense of the five elements of fiction: character, plot, setting, theme and style) is distinct and unique in the comic world. He has carved out a niche with a particular audience in mind. Recommended: I recommend this text especially to talk about audience, perspective, voice and style with kids and teens. I highly recommend the book for adults, especially fathers of young children. We had a little comic convention in town today and I was sure to promote it with the students in THE HALL OF HEROES comic book club. I had a couple of students show up while I was there and I hope others attend (and find comics) throughout the day. This week's list includes all the comics collected either from the mail, comic book shop or the convention. Last week I told you that I was working on an earthquakes lesson plan inspired by the real life tragedy in Haiti. Third and fourth graders didn't quite finish their poetry this week so I am giving them another day (as I have 5 sections each of grades K-5, one week in the regular elementary classroom is only one day for me). This week they shall publish, period. That's good because I am not ready for the earthquakes lesson anyway. 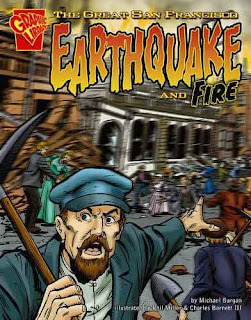 I have a surprise for you, especially for those who are considering their own earthquakes lesson: I found another comic to use called THE GREAT SAN FRANCISCO EARTHQUAKE AND FIRE. 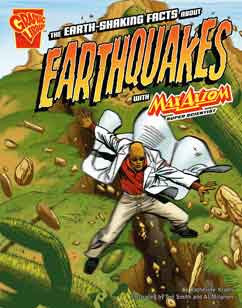 This one is a social studies comic and is published by Capstone just like THE EARTH-SHAKING FACTS ABOUT EARTHQUAKES WITH MAX AXIOM SUPER SCIENTIST discussed earlier. Both came in this week. Stay tuned kids. I have not forgotten this lesson. I'll publish it as soon as I can complete with web resources, links to videos, and anything else I can fit in. I'm really jazzed about the lesson, but overwhelmed with the time frame that I have to develop a rich, technology-infused lesson. Makes me shake in my boots. building – being a photojournalist is not likely to be my second career. 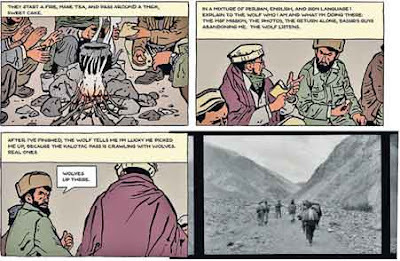 In the graphic novel, French photojournalist Didier Lefèvre treks from Pakistan through the mountains of Afghanistan during the height of the Soviet occupation in order to document the heroic efforts of Doctors without Borders to establish a clinic. He braves dizzying mountain climbs, blizzards, recalcitrant donkeys, sometimes unreliable mujaheddin, Russian carpet bombers, and a nasty case of furunculosis (http://en.wikipedia.org/wiki/Boil) which claims 14 of his teeth and leaves painful boils all over his body. He takes over 4,000 photos on the trip but only six are published. Finally, just as this graphic novel is published and his work begins to find a wide audience in France, he dies in 2007. I think I'll plan my lesson on metaphors and similes now. The graphic novel, though, is nothing less than a revelation. Guilbert intersperces the astonishingly beautiful work of Lefèvre with a illustrated graphic narrative, filling in the gaps between the photos to give context and story to the photographer's experience. For instance, one of the most luminous photos is of a donkey and two mujaheddin. Lefèvre comes off as a dedicated and passionate artist who is willing to do everything from choke down oily walnut tea to traverse mountain passes in wild blizzards to bring back his photos. He doesn't always depict himself as a saint as several times his irritable impatience leads him into more trouble than was necessary (at one point he decides to leave Afganistan alone rather than wait for his colleagues to return through a more roundabout route). 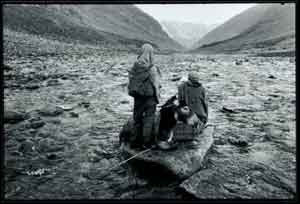 But Lefèvre's dogged quest for photos and understanding is inspiring. The photography is the wow factor here. When Lefèvre thought he was going to die in a blizzard, he describes taking what he thougth would be his last shot "to let people know where I died." The resulting black-and-white photos are illuminating and revelatory, perhaps more so because the art panels surrounding them are so simple and unprepossessing. They tend towards neutral colors with only a few splashes of color. It is, though, the clever interspersing of photos that works best. Lefèvre will often talk about the preparations before the shot before revealing it, or connect the panels of participants with photos of them. By the end, it feels as if the story couldn't be told in any other way. Among other things, THE PHOTOGRAPHER suggest an entirely new format to tell stories. Students could join with photography students and tell narratives that combine art and photography in startling ways. For example, imagine using a classic English teacher assignment of interviewing war veterans combined with illustrations of the story the veteran tells. Even, say, a job shadow where students follow someone in a particular occupation could be rounded out by the joint photo/art combo. 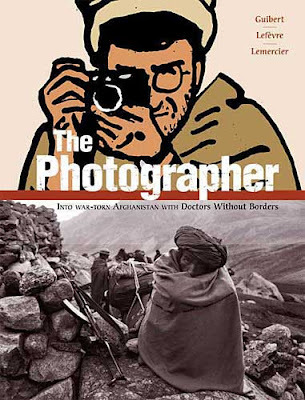 Teachers of social studies or lit teachers with a war unit could use the book to show another side to the Russian occupation or to gain insight into Afghanistan. Standardized testing is coming fast. Missouri’s state standardized test, the MAP, is on our heels and everyone is always working year-round toward higher order thinking skills, reading and writing. I am working on several reading and writing lessons using nonfiction science comics. in order to help students be successful in life and on the tests. Young students are asking (and I suspect older students are quietly wondering) about the whys, hows, and whens of earthquakes. Everyone is trying to make sense of the horror and destruction in Haiti. We can raise money and write about how we feel – both great things – but we can also study the science behind earthquakes. While this title will be the foundation for my elementary lesson, it could also be used as a supplemental book (differentiation) for middle school and high school students. My plan, as it stands right now, is for grades 3-4 to create a brochure, PowerPoint, blog post, poem, story or comic (using a online create-your-own-comic site) about earthquakes. Look for a review in the coming weeks. In January 1940, in an era known as the Golden Age of Comics, a new superhero debuted in the pages of Pep Comics #1. This character was the first to completely embody the ideal of patriotism. Known as The Shield G-Man Extraordinary, this superhero worked for the FBI, under J. Edgar Hoover himself, stopping the very forces that would destroy America and protecting the very fabric of democracy. Initially fighting fictional characters known as the Stokians and Mosconians, the story line changed to reflect America’s campaign against the Nazi regime as America engaged in World War II. Youngsters were encouraged to join the Shield G-Man Club and even received an official membership card. The Shield was freedom; he was the flag; he was a government-issued crusader for justice and he wore the stars and stripes to prove it. I ordered THE SHIELD because I wanted to be able to give students a chance to read Golden Age comics and be safe in their interests of war. Believe me, many fourth grade boys are very interested in war, yet many schools and parents are fearful of the influence. With brightly colored pages, densely packed panels, and action that is high paced but not overly violent, kids can be safe in their investigations. The stories are, at times, ridiculous or fantastic, but reading the comic in context allows for that experience to be rich and enjoyable. This comic and others from the Golden Age are the foundation of American comics and the reader needs to consider the time period, the history, and the culture in order to appreciate the story. I found THE SHIELD to be fascinating in its thick patriotism, cultural adherence to classic American ideals, and its unending trust of government officials, which starkly contrasts with today’s general suspicion of all things governmental. In that light alone, THE SHIELD was worthy of study. However, I also connected to the roots of comic literature – the color, the art style, the panel arrangement – and it gave me a feeling of closeness to early comics. It did the same with my students who read it, who are now more likely to read and enjoy vintage comics. In fact, I have a handful of boys who, after reading it and sharing it with their friends, are asking for more war comics and old comics. Asking to read, begging to read more, is my top priority. Once kids want to read, they can learn all those skills to make them better readers. These stories are full of fisticuffs, poor treatment of bad guys, and bullets (which bounce harmlessly off the protagonist’s chest. Attention all librarians. If you have been interested in putting comics in your library but don't have the funds, then this is a great chance for you to get some for free. 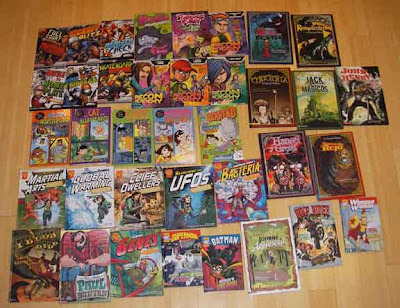 Toon Books, publishers of graphic novels highly recommended for children by The Graphic Classroom, is running a raffle for librarians. The winners, the word was plural in my press release, "will receive a set of books of their choice for their library, as well as an advance copy of ZIG AND WIKKI," a science comic. I'm sitting at my computer with my sugar free hot cocoa watching the snow come down. The news stated it is colder here in Missouri than it is in Alaska. School is canceled, I suspect, more from the dangerous cold than the snow. The meterologists are forecasting anywhere between -10 to -20 degree wind chill factors. I've cooked vegetable-beef soup and chili, watched CLOUDY WITH A CHANGE FOR MEATBALLS with my daughter, and am planning on some comic reading and reviewing today. (We might game some, too.) I thought I should get some work done today, so the posts for this week came early. The Ronald Reagan comic made me think of other nonfiction comics. Incidentally, we are planning on reviewing some titles for Black History Month (February) featuring prominent African Americans. So keep a look-out for those. I've listed a few titles we are considering in case you want to purchase them now. I know there are comics on Martin Luther King, Jr., Oprah, Malcolm X, Nelson Mandella and other leaders in the Black community. I was so excited to get this book, which is part of a new series just put out by Capstone Press that focuses in on great moments in history through the exploits of the main character, Isabel Soto. 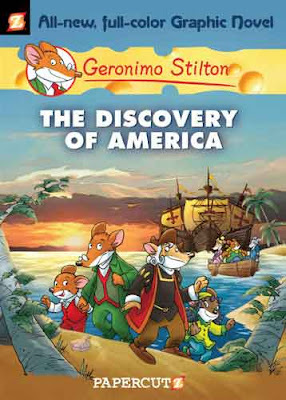 This series of adventures is closely related to the Max Axiom series, which centers on science. In BUILDING THE GREAT WALL OF CHINA, Soto uses her magical technology device to transport herself, and a young friend, to the times in China when the Great Wall was being built to keep the invading Mongols out. There is plenty of adventure on these pages written by author Terry Collins, particularly when Soto must rescue her guest as he starts to fall off the wall even as the structure is being pounded by invaders using catapults. Along the way, crucial and intriguing bits of history of the Great Wall of China emerge – sometimes as part of the story itself and sometimes as quick diversions to the main story. The end result is the reader has a strong female character to root for while learning about important elements of history (and even dispelling some of the myths that surround the Great Wall). The artwork by Joe Staton and Al Milgrom is perfectly suited to the story. The frames show a lot of high action and adventure as Soto jumps back in forth in time from present day to the past, when the wall was under construction and then under attack. This book, as well as the other Isabel Soto graphic novels, could find a nice place in a history curriculum. The story is engaging and educational. I did like that the book also includes two pages of historical facts about the Great Wall of China. The book also contains an important glossary of terms that may be out of the vocabulary range of some readers as well as a list of more books on the topic. 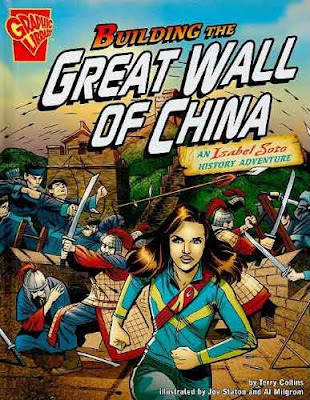 I do wish that the quick fictional biography of Isabel Soto was at the start of the book, not the back, so that kids could know who she is and why she is traveling through time to different historical periods. I would highly recommend this book for any upper elementary, middle and most high school classrooms, although the reading level is more attuned to middle school readers. It is an informative and engaging book. There is nothing inappropriate in here. In the classroom, graphic novels offer the greatest help to teachers of Shakespeare. The difficulty of the language and the importance of visualization provide students with the clues they need to translate 16th century drama into a story that means something to them. Most teachers use some form of drama to get at that aspect of Shakespeare, but graphic novel versions of texts can add another layer to the interpretation. Two recent graphic novel versions offer wildly different strategies in making the Bard come to life on the page. 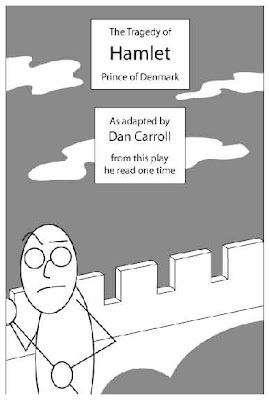 Gareth Hinds’ KING LEAR and Dan Carroll’s STICK FIGURE HAMLET rest on opposite sides of the spectrum. Hinds employs a gorgeous and intricate artistic style while Carroll literally sketches stick figures in a series of boxes. Hinds’ LEAR doesn’t confine itself in Calvin and Hobbes-like comic boxes but instead uses full pages with a swooping eye-line of dialogue. 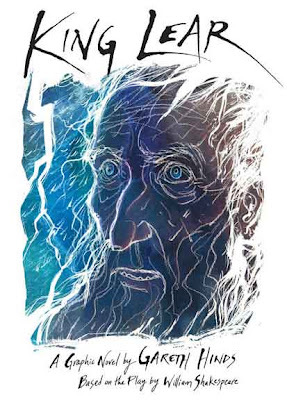 The art is all pastel washes and sharp lines; LEAR’s famous “Blow, winds, and crack your cheeks!” soliloquy outlines the king in white lines on a dark background so that he almost seems to be a negative photograph of himself. The fool hides under his robe for his lines. Hinds does make some decisions with lines that teachers might quibble with. For instance, he excises the line “Her voice was ever so soft, Gentle, and low, an excellent thing in women.” because of the sexist nature of the line. Most of his cuts are done for dramatic effect and accessibility, but a few reach and pass over the line of Bowdlerization. Still, the overall effect is magical and a great boon for students struggling to make sense to the play. Carroll’s HAMLET is altogether different. The box upon box format is almost never interrupted and there is only the slightest attempt at differentiating between different characters. The graphic novel does, however, make clear that only a few cues from stick figures can help at least get the gist of what characters are feeling during their exchanges. It won’t be much help in chewing through a monologue (like “O, what a rogue and peasant slave am I!”) except for the bare outlines of what’s happening. The style also tends to give the whole play an atmosphere of parody and unseriousness; it’s hard to care about STICK FIGURE HAMLET’s feelings. Throughout, Carroll seems to want to puncture the pompousness of the Prince of Denmark without being able to render some of the most beautiful passages in literature with any of the gravitas they deserve. Undoubtedly, students will find the graphics a reasonable help in decoding the play (especially as the work is available online), but it does undercut the power of HAMLET. "As a freelance writer, one in the early stages of his career, I know just how tough it is to break into comic books. I’ve often heard aspiring artists say there are no openings. I’m therefore proud to be part of this Mohawk Media initiative to give artists the opportunity to become published, and be involved in some of the coolest titles of 2010!" Bunting when on to say that he is looking for those who possess the skills necessary to demonstrate comics as a storytelling medium. For more information contact Bunting at: chris@mohawkmedia.co.uk.